I’m the only person in my family who doesn’t wear glasses. That is not a joke either. I quite literally mean that. My husband, all three of my children, my mother, my grandmother, my first cousins, … even my two in-laws. Every single person I know and love wears glasses. So, I’ve been to my fair share of eye doctor appointments. Over the years, I’ve learned a few lessons and wanted to share them with you to help answer some questions. In order to get through the process as smoothly as possible, here are a few tips for parents who have children that are heading to the eye doctor. My daughter got her first set of glasses last year and her doctor told us that she really didn’t need them. The prescription was so slight that if she didn’t really want to wear glasses, he wouldn’t be opposed to us opting against the process. She could wear them or not. That’s how minor the issue was. Natalie really wanted lenses, so we chose to get her a pair of glasses and off we went. However, halfway through the year, she started to complain about not being able to see the board. She kept telling us that the glasses were no longer working. I kept reminding her that the doctor said she didn’t really need them to begin with. We decided to take her in a bit earlier than our insurance allowed just to be sure and low and behold… her eyesight worsened dramatically since her last appointment. In fact, during her first visit, one eye had no issues at all. During her last visit, both eyes showed a significant decrease in eyesight. Her prescription was changed and apologies were made. I wish I didn’t wait as long as I did. I waited several months before taking her in. My biggest advice to any parent is to always listen to your children and make sure you get their eyes checked every year, just like their physical check-ups. 1 in 4 children across the country struggle with undiagnosed vision problems in school. Undiagnosed/untreated vision problems in children can lead to headaches, avoidance of schoolwork, acting out in class, perceived inability to comprehend assignments and more. If your child begins to complain about not being able to see the board, that is an indication that he/she might be struggling with their sight. Back to school is the perfect time to get an eye exam or an updated prescription for your children. 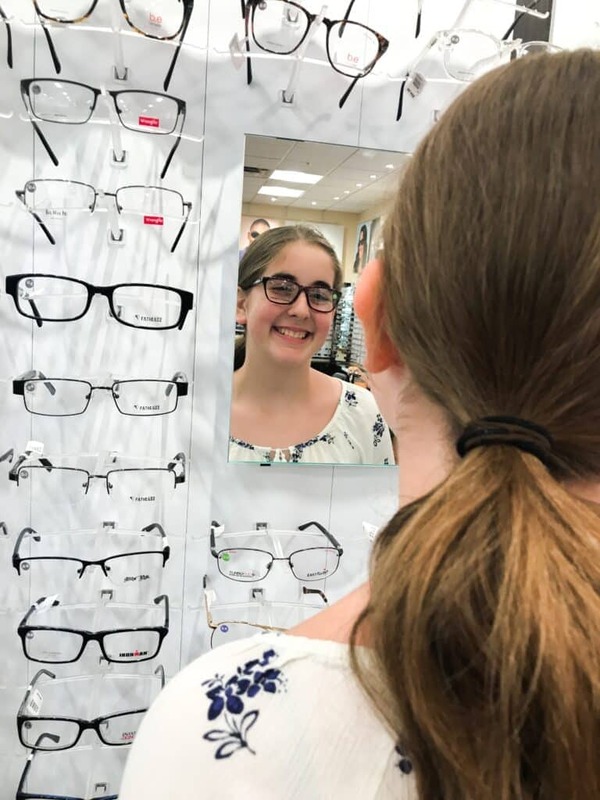 If your children need new glasses, Walmart Vision Centers offer 20% off additional glasses when you buy more than one pair. Each of my children has two pairs of glasses. This is so important because – without fail – we always tend to lose one right before a big trip/concert/event. The second pair comes in handy when we are on the go. My boys always tend to break their glasses (more on that in a bit) and while the lenses and frames are being fixed, we have an extra set at home to wear. glasses in hand at least once a week with no issues!! And you know what? We are always greeted with a smile! Because of the guarantee, the glasses always get fixed. THANK YOU!!!!!!! Walmart Vision Centers’1-year guarantees gives you peace of mind. Trust me – with children – this is an absolute must. 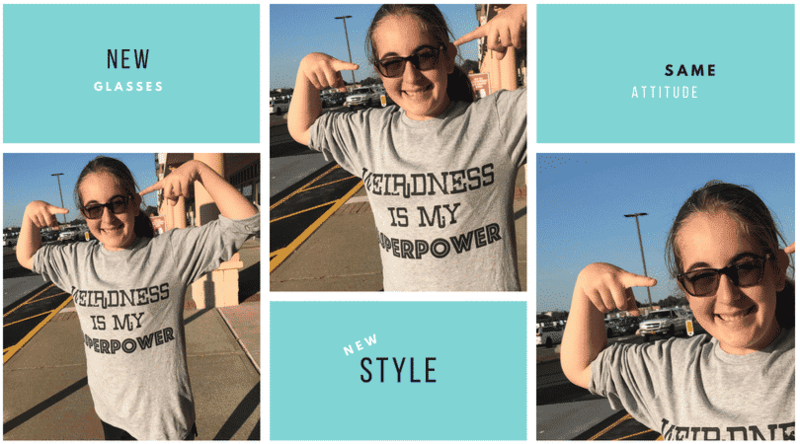 You probably aren’t even THINKING about Transitions lenses for your kids, but two years ago we opted for them when purchasing frames for our middle child, Liam, and it was one of the best decisions we ever made! Transitions make wearing eyeglasses hassle-free. No need to worry about carrying around two pairs of glasses because no matter what, his glasses adjust to whatever situation he is in. We love it! Transitions lenses are intelligent, in that they darken and lighten automatically in reaction to changing light. Transitions® Light Intelligent lenses make every day simpler and that’s exactly what I am looking for as a mom. Transitions® lenses filter Harmful Blue Light from artificial sources, such as digital devices and LED lights. In this day and age, with all the iPads and gaming our children do, I am so happy to know that his glasses are working to protect his eyes during screen time as well! I don’t know why we didn’t do that for Natalie last year during her doctor appointment. Probably because we thought she really didn’t “need” them so we weren’t sure if she was going to wear them at all. Well, this time around, she absolutely needed glasses. So, while at the Walmart Vision Center, we asked for Transitions lenses technology to be added to her Nikon Eyes lenses. Walmart offers Transitions lenses that automatically adapt to changing light conditions. Currently, Transitions lenses are available gray, brown and graphite green, and can be paired with almost any frame. If you are looking for a premium experience, you can have one with your lenses as well. Opt for premium, high-quality Nikon Eyes® lenses – which are advanced, innovative lenses – exclusive just to Walmart Vision Centers. Nikon Eyes provide sharper vision and offer a better perception of details. They also have TotalShield™ protection against scratches, smudges, and glare, because as we all know, kids are active. Plus – total bonus – they are easy to clean. Nikon Eyes are available for kids and adults. I know you want to help them, but your kids are going to be the ones wearing the eyeglasses and they have to be the ones comfortable in them. I’ve tried to offer up fashion advice to my little ones, but it always ends up backfiring on me. You can get away with it for a few years, but once your kids start to have opinions of their own… let them have opinions of their own. My 13-year-old daughter knows who she is. Frames are very personal. They are an extension of someone’s personality if you will! We – as parents – should accept we have no say in something as personal as facial accessories. Because that’s really what eyeglasses are. Am I right? Enter this giveaway for a chance to win a $250 Walmart gift card, to spend at your local Walmart Vision Center!! BONUS ENTRIES if you Re-Tweet this post on Twitter, Share on Facebook, Pin to Pinterest, Share on Google Plus, or Re-Gram on Instagram. Leave the URL link in the comments below!!!! 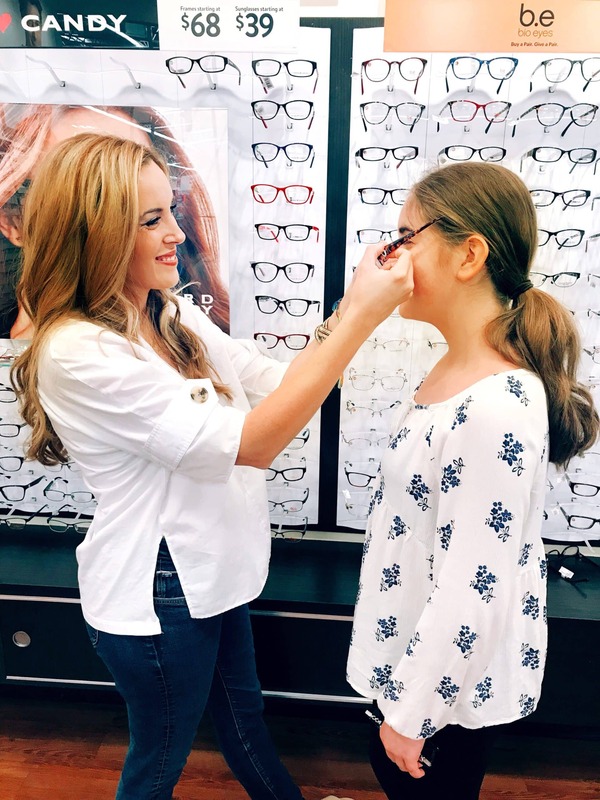 Need new glasses to your child back-to-school ready? To find the nearest Walmart VisionCenters, click here. Yes, eye exams are always on our back to school list! All three of my kids wear glasses, like me! Yes. It’s time for our annual eye exam in August. Yes, it is apart of our back to school preparation. I shop there a lot AND I got my own eyeglasses there as well as my husbands. I was pleasantly surprised how affordable they were even with the extras like bifocals, Nikon lenses and transitions! We just moved recently and this gift card would sure come in handy! Yes, my daughter has an appointment in September for a checkup. I’m hoping that they aren’t bad. She seems to have a little problem with words far away. Yes these items are on the back to school list. Yes, both are a part of our back to school plans. My 7 year old wears glasses. He has been wearing them for 2 years now. He unfortunately inherited strabismus from me. We opt for Transition lenses anemia a 2nd pair too. He is super opinionated, so he picks out his own frames. We are fortunate that he likes wearing glasses. A Walmart gift card is always useful. A new pair of glasses would be nice. I have an eye exam coming up soon. Yes, both boys will be having eye exams. So important. Eye exams are definitely on the to-do list before school starts!! Yes we all need exams and new glasses. Eye exams are always on the list! I want to make sure my kids can read the board and books! Thanks for the chance! Eye exams and some new glasses are on our list. Yes my Son needs a new pair of glasses he also wears contacts back to school is such a crazy busy time here! I get an eye exam every other year and new glasses when my prescription changes. Eye exams in our family were done in the earlier part of the year. New glasses (1 pair) and 2 eye exams for us this year for Back to School! Yes, we will all be getting eye exams. I love reading your blog posts as you really hit the nail on the head with this one as far ss glassses are concerned. Super informative, thank uou! Yes, my whole family needs to get our eyes checked. I need new glasses but not sure if my son will need them. He currently does not wear any. Thanks for the chance. No my son’s eye exam is not scheduled until February 2019. Yes they are both on the before school to do list! I do need to get an eye exam and probably new glasses or a least a spare pair. They are not on my back to school list this year….they are an annual event….or as needed. 🙂 Thank you. An eye exam and new glasses are actually on my to-do list, but fortunately not my grandsons yet as they don’t need glasses. Yes, we need to get our eyes checked! Eye exams are on the back to school to-do list for sure. And it is great to have Walmart for eye needs! I went to the eye doctor last week. No changes needed. Just went to the eye doctor last week. No changes needed. Yes. We need to update our eye exams. Went for eye exams and new glasses just about a month ago. Yes! It’s time for my kids to get their exams! Not as a back-to-school item, but I do need an eye exam. I always have my daughters eyes check before back-to-school starts as it’s one of the things that’s on the list. I just recently had to get some new glasses. Thanks for the awesome giveaway! No glasses besides sun glasses and my girl gets a free eye check up at school! Yes. It is time for the yearly exam this month! I so need an eye exam and some good new reading glasses I am afraid that the ones I am using are making my eyes worse. Just posted my comment but don’t see it hope it is pending. Not on my back to school list, but we do go every year! Absolutely! I have a 4th grader with her mama’s poor vision. This year will be her 3rd pair of glasses. My daughter is up to date on her eye exam but me and my husband are way overdue. yes, we need to get eye exams. We had our exams just last month. We get our eyes checked and new glasses in December! Yes, we have eye exams every year before the start of school. Fortunately neither of my boys need glasses however this Mama does. I have an exam next week and hope to get a new hip pair of glasses to show off in the classroom. I need an eye exam, and so does my father and younger brother! It’s a MUST before school starts! My daughter just recently had a new eye exam. When I was young and needed glasses, my mother didn’t believe me and told me I was just wanting to be like my friend who wore glasses. She wouldn’t take me to the eye doctor for over a year until I wore her down. My eyes were terrible! My own daughter started wearing glasses in the 1st grade. My grandkids have their eyes checked that’s how we knew that one of our granddaughters needed glasses. The glasses have seemed to have strengthened her eyes too. She loves her glasses and got them in the color she wanted. That helped with her wanting to wear them. This is a very informative review! Pin & Facebook worthy! Yes, they are always on my to do list. My mom has glaucoma so I keep an eye on all of our eyes! My 7 year old daughter wears glasses. Shes scared to go to school this year because shes afraid the kids will pick on her because of it! I feel terrible that I cant afford the glasses she wants! I don’t have a back-to-school list because my kids are all grown. I do get an eye exam every year and replace my glasses as needed. Yes, my kids actually had their yearly eye exam yesterday. My kids already got their new prescriptions in April, so we are good to go for school. We get them checked every year. new glasses are definitely on my back-to-school list. I just had my exam done last week! No eyeglasses yet – my kids are pretty young. I just got new glasses myself a few months ago! We have just been considering that the 4th grader needs to have his eyes checked, he has been complaining of headaches rather frequently. But it is a real possibility that he has just been watching too much TV recently! No, did it already earlier in the summer! My daughter will be needing new glasses probably this fall at her next eye appointment. Eye exams and glasses are not on the back to school list but school clothes are. Yes, eyeglasses and an eye exam are on my family’s back to school list this year. The coating on my glasses has started coming off so I definitely need to look in getting a new pair and most likely get my eye prescription up to date. No, but that’s only because we took my daughter to the eye Dr over the summer. 2 new pairs of glasses!! Yes, my son needs to have an exam and probably glasses. No we had eye exams over the summer. The moment when you confuse a child for a trash can is the moment you need new glasses, no excuses. I’m reaching that threshold. My son needs new glasses and my daughter needs to go for her first exam. I usually wait until the end of September. My kids, admittedly, don’t read a ton in the summer, and giving that month into the school year gives me time to observe and get feedback from their teachers. Yes, everyone in my family wears glasses so we schedule our yearly eye exams near the end of summer. Yes! I’ve needed glasses for years and think I can finally afford them. My nephew does not wear glasses so far. But he gets tested every year just to make sure. 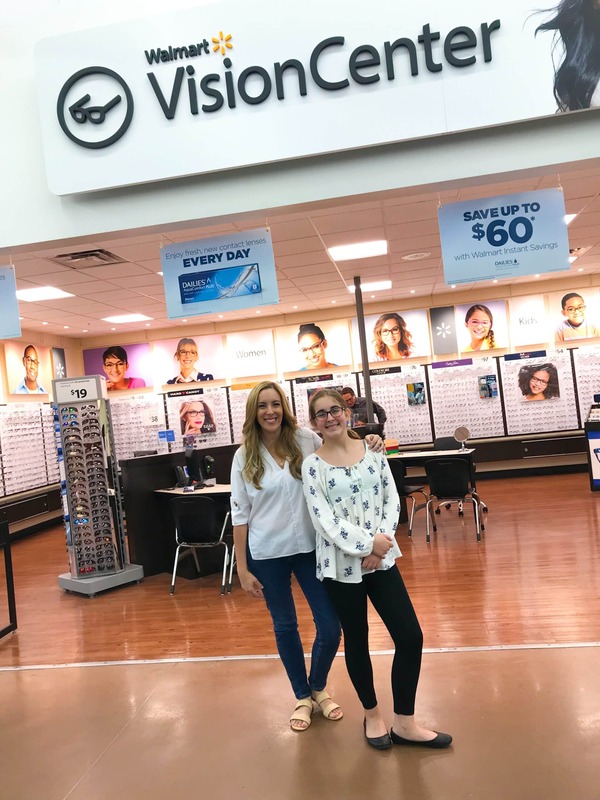 Not necessarily on my back to school list but my daughters do get their annual eye exams and one daughter wears glasses! Not on my list this year! Yes, we are overdue for eye exams and glasses. I personally could use some new glasses. It’s been years now and I really need to get them checked out again. New glasses and frames are close to the top of the list. Yes we usually get new glasses before school starts. Both my youngest sone and I are scheduled for eye exams this month. Eye exams were on my back to school list this year. Lucky none of my children needed eye glasses. Yes it has been a few years since I had my eyes checked I should go. Yes, eyeglass are on my list. 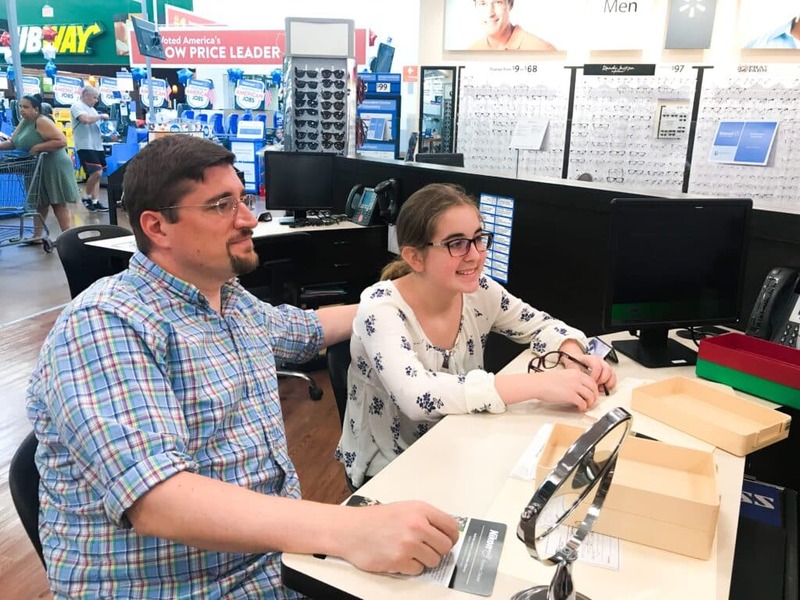 It’s about time for my 14 year old son to get new glasses and I’ll be a better cheerleader for him him in picking a new pair thanks to the tips here! Thanks! I think of 2014 as the year of the headache. It took several weeks to figure out that the headache wasn’t from going cold turkey on Diet Coke, but that I needed new glasses. As someone who was 20/2000 in the ba eye, I should have realized it sooner. Eye exams are not due yet for any of us and no one is having vision issues so thankfully this is not an added expense at back to school time. My three little ones just had their eyes examined & thank God they’re fine, but this Mama needs an exam & new glasses! We homeschool; so, we don’t have any back-to-school lists. However, we do go in for regular eye exams. Thankfully, no new glasses on our BTS shopping list. My daughter had her exam in April. With a -5.75 and a -6…this will come in handy. One time her glasses were misplaced and with a prescription that high she couldn’t see a thing. My 8yr old wears glasses so it is a must on our list. My baby went from -1.75 to -3.75 so we change glasses often. We had all of our eye exams in January, so we are all set. On the back to school list: Eye exams. No but they should be! My mom just got new glasses a week or two ago. I just had my exam about three months ago, vision is still great. Yes. I have not had an eye exam in two years. My daughter needs new glasses! They are! I need new glasses. I can tell my eyesight has changed in the last 2 years. My son just got a new prescription so he need new lenses. Yes! My daughter is getting her eyes checked and she will probably need an updated eyeglass prescription. No they are not on my list right now but sometime this year hopefully! Thank you! My girls are graduated but my youngest did go for an eye this summer. Yes, all three of my kids and I wear glasses! They were! Both girls got new glasses from Walmart for new school year. An annual eye exam and/or screening is essential for your child’s health and learning ! Eye exams and a new pair of glasses are most definitely on my to-do back to school list. Eye exams and new glasses are on our back to school list every year for my 3 girls. Absolutely! We all need to do an exam and get updated prescriptions. I actually have an eye exam scheduled for 9/5. Yes, all 3 of my kiddos had eye exams before school. My middle girl needs glasses now, so I love these tips! Both my son and daughter had eye exams and both need new glasses for school. Eye exams and new glasses are definitely on my back to school list. Yes, my whole family get their eyes checked over summer break. Although my youngest is the one starting her senior year at ole miss, having my eyes checked is on my list. I put it off until I can’t anymore. Yes, eye exams and eyeglasses are very much needed here, and I’m actually excited for it. I need to get a eye exam. Im going to make appt this wk!